Reports from Iran indicate that on Friday June 20, police and security forces once again prevented women from entering the stadium to watch a volleyball match between Iran and Italy, and a number of them were even arrested. The Khabaronline website reports that women who arrived at Azadi Stadium to watch the game were forced off the premises, and even women who had arrived carrying press passes from the Volleyball Federation were led out of the stadium. Jila Bani Yaghoub, a female Iranian journalist who tried to attend the game, reported on her Facebook page that the stadium was full of anti-riot forces and the area was patrolled by police vans. She added that the security forces were more violent with "the women and the men who supported these women compared to the last volleyball game." She added that 15 people were said to have been arrested. Another female journalist who tried to attend the event wrote on her Facebook page that she was detained for about six hours and 16 other women were also arrested. Last Friday, Iranian women were denied entrance to the volleyball match between Iran and Brazil at Azadi Stadium. President Hassan Rohani has called for an inquiry into the incident by his Women's Affairs aide and his Minister of Sports. 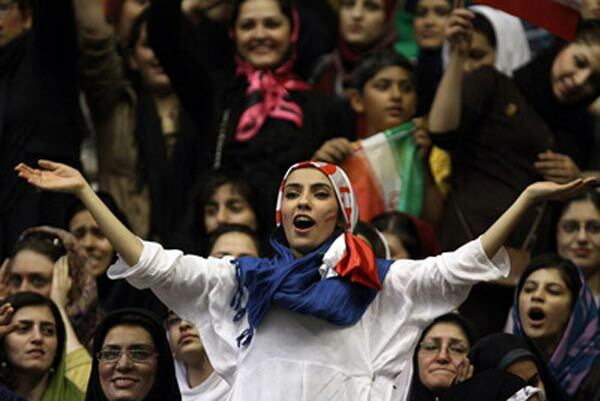 The Iranian Volleyball Federation has announced that its own regulations say women are allowed to attend matches.